When Google first introduced Google Places (formerly Google Local) listings in their search results, the phone books were officially added to the endangered species list. Historically the old phone book companies that would proactively contact attorneys each year make sure their listing were up to date and made the process easy to update and renew. With the advent of Google Places, attorneys must now proactively claim their listings, optimize them, and make sure they are working properly with their attorney websites. To further complicate the issue, Google has now blended the website and places listings into one result for the most common attorney searches online. For those who have searched over the past few weeks, you will notice that the displayed results have changed…again. Google has now placed the address and phone to the right and more importantly the way the company name is displayed in the blended results listings. Historically, Google would pull the company name (or attorney or firm name) directly from the Google Places name. Naturally, this created problems for Google since people would, despite Google’s policy to the contrary, change their firm name to better present themselves and increase conversions for specific searches. This worked fine for a while until Google started validating their listings (finally) and suspending accounts that violated their policies. Ironically Google is now doing through their results page what many attorneys previously had tried to do themselves: provide better conversions and targeted results for their Google Places listings. 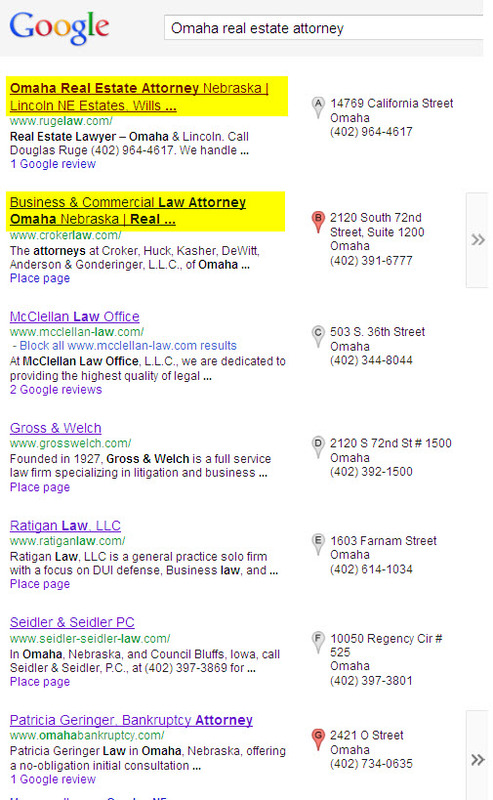 In the example to the right, you will see the listings for the “Omaha real estate attorney” search. Notice how the top two listings display details about the attorneys (Highlighted: that are not the firm’s name in Google Places) while the others do not. What is displayed in the first two listings are from the Title Tag of the home page from each website. Also notice how the title tag displayed is only relative to the search query. For example in this search, Omahabankruptcy.com is displayed as “Patricia Geringer, Bankruptcy Attorney” but if we change the search to “Omaha bankruptcy attorney” we see that not only is Patricia’s position improved but the title tag of her website is also now displayed. If you are an attorney, you need to identify your practice areas of concentration. If you only do bankruptcy work, this is easy. But if you have multiple practice areas, you need to understand your concentrations and narrow them down to 2-3 for the home page optimization of your website. A good law firm marketing consultant will be able to assist you with this. Once you have identified your 2-3 areas of concentration, go into Google and do searches within your targeted geography and identify those search results for your targeted practice areas that display blended Google organic and places listings as used in the example. If no Google Places are displayed for specific searches (i.e. 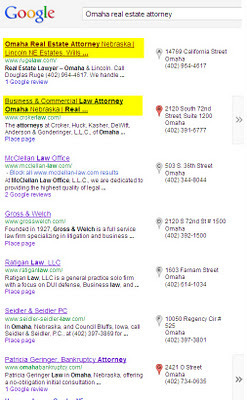 “Omaha Land Zoning Attorney”), then you know you are too narrow in search. Once you have claimed and complete your Google Places Optimization, make sure that you review the SEO elements of your website and in this case – the title tags on the home page of your website. MAKE SURE that the home page title tag contains the keyword search terms that are most important to your practice areas of concentration (as discussed above). Again, a law firm SEO consultant will be able to assist you with all of these steps. Great tips you have shared with us and i learn very much from your technique and now i hope i can see my site on top. I admit, I have not been on this webpage in a long time... however it was another joy to see It is such an important topic and ignored by so many, even professionals. professionals. I thank you to help making people more aware of possible issues.Great stuff as usual..
Meta tags(Title, Description, Keywords) are the one user will see in the Google search result per page and it is very important to place an appropriate title and description in your website so that you can promote it very well. Amazing explanation,i've notice that google always changing their page result depends on keyword because everyday in search result there is a lot of competing in number 1 place.